If you're on a vacation to Boston during warm-weather months, you won't want to miss the storied towns and beaches of Cape Cod, Martha's Vineyard, and Nantucket. But you won't just be surrounded by other travelers: When New Englanders want to get away from it all, they flock to Cape Cod and its neighboring islands off the coast of Massachusetts. It takes about an hour to drive to the edge of Cape Cod from Boston, and longer if you're traveling during a busy summer weekend. If you're on vacation, the smart money is on making the trip to Cape Cod and/or the islands during the week to avoid local weekend crowds. If you're heading to the Outer Cape, it's actually faster to take a ferry from Boston to Provincetown. To get to the islands of Martha's Vineyard or Nantucket, hop on a ferry from Wood's Hole or Hyannis on Cape Cod. 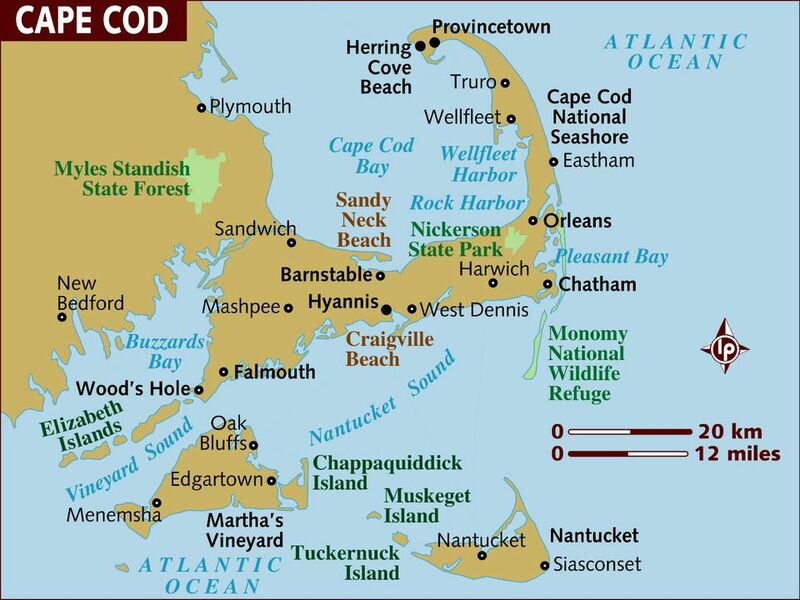 Cape Cod is a 65-mile-long peninsula that curls like a flexed arm. Its 15 yesteryear towns seem to have been plucked from a Norman Rockwell painting, while the Cape Cod National Seashore has ensured that little development is allowed on almost 30 miles of its Atlantic coast beaches. There can be a lot of differentiation between the various areas of Cape Cod and the kind of visitors that are attracted. Mid Cape: The "bicep" and "tricep" of the arm, including the towns of Barnstable, Hyannis, Dennis, and Yarmouth. One famous landmark in Hyannis Port is the six-acre oceanfront compound owned by the Kennedy family, which was originally the home of Joseph P. Kennedy, Sr. and his family that included sons John F. Kennedy, Robert F. Kennedy, and Ted Kennedy. Outer Cape: This is the area above the elbow to the curled fist, including the towns of Eastham, Truro, Wellfleet, and Provincetown. One of America's most iconic summer colonies, the 100-square-mile island of Martha's Vineyard is famous as a tony vacation spot favored by celebrities and U.S. presidents, most notably President John F. Kennedy and President Barack Obama. Edgartown has emerged from its whaling past as the most upscale town on this upscale island. You'll see the former homes of sea captains of the 19th century. Walk the 2.75 miles to Chappaquiddick Island across the sand or take a ferry to fish or just enjoy its peaceful and quiet ambiance. There are plenty of fun places to eat, lovely places to stay, and interesting places to shop on Martha's Vineyard, along with people-watching, of course. Less tony but equally as charming as Martha's Vineyard, Nantucket retains the flavor of a 19th-century New England seaport town. It's just 30 miles from Cape Cod. You can stay in a resort, boutique hotel, or an inn on this island of beautiful beaches, lighthouses, and museums. If you like you can take the ferry to Nantucket and just bike around the island. You won't need a car to enjoy this quintessential image of New England.